Have you ever wondered why your joints are stiff in the morning? There are many reasons you may be feeling this -- some are just part of a normal process and others may be cause for concern. 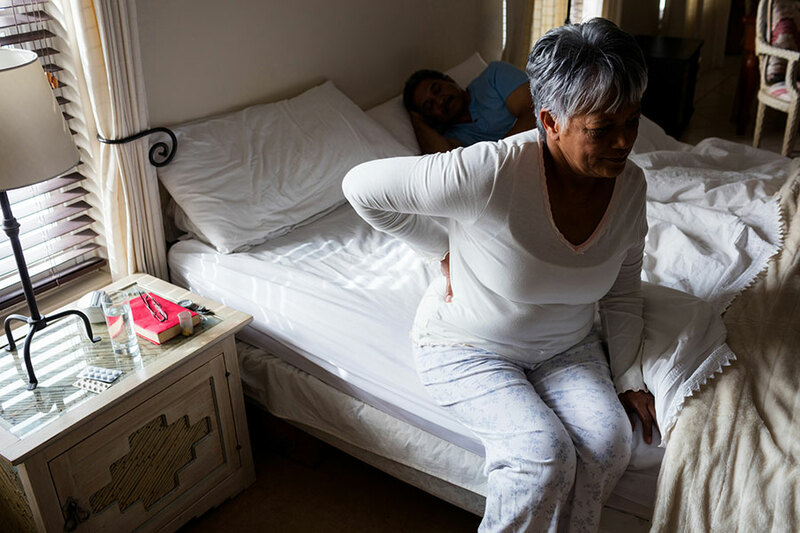 For people who suffer from arthritis, this morning pain or stiffness may be caused by a lack of lubrication in the joint spaces, or from a breakdown in the cartilage that covers the ends of the bones. This can happen in your back, fingers, wrists, knees, ankles, or feet. Many who experience this morning pain find it is short-lived, resolving on its own within 10 or 15 minutes. For others, though, it may linger and begin to affect the rest of the day. Fortunately, there are some ways you can prevent or reduce the amount of morning stiffness you experience. Sleep. Be sure you get plenty of deep sleep. This is how your body and mind refuel and recharge. It is when healing agents within your body repair areas that are in need. Be sure to allow for time for this process to happen. Your Mattress. Consider the condition of your mattress. If it is too firm or too soft or not supportive, this can lead to poor sleeping position and overnight strain on certain muscles. Gentle Stretching. Before getting out of bed, do some gentle stretching while you are still cozy under the covers. Gently do ankle circles and ankle pumps, wrist circles, bend your knees and hips. Hot shower. Start your day with a hot shower. The warmth of the shower can help relax stiff muscles and bring comfort to your morning. Be active. During your day, include periods of activity. Exercise, walk, and/or stretch during the day. If you sit for extended periods of time, make time to change position. Be sure your desk or comfortable chair is supportive and does not contribute to muscle strain. Eat well. Be aware of how your diet affects your joints. Certain foods can cause inflammation or can affect your ability to fall asleep if consumed close to bedtime. Being mindful of your diet can help prevent joint stiffness upon waking. Take your medicine. If you have been prescribed medication to help with your joint discomfort or stiffness, set your alarm and take them 30 minutes to an hour before you get out of bed. Then your medication will begin to work as you need to start your day. Learn more about the Lifespan Orthopedics Institute and how our team can help you. Leigh Hubbard is a certified orthopedic nurse and the program manager for the Total Joint Center and Pre-Admission Testing at The Miriam Hospital. She earned a bachelor of science in nursing degree at UMass Dartmouth and a masters degree In healthcare administration from Salve Regina University.